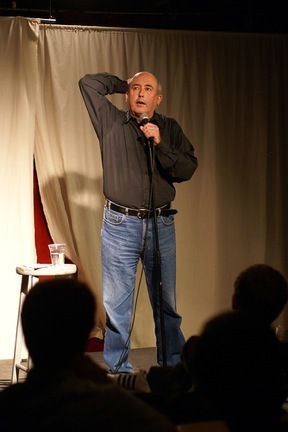 Welcome to John Keister's website, Seattle's comedian, emcee, keynote speaker, writer, director, & actor! for over twenty years! Hello, I'm John Keister. You may remember watching me in Seattle from 1988 - 1998 on Channel 5, Saturdays at 11pm right before Saturday Night Live. Chances are you were getting really drunk at the time. The station's researchers informed us that Almost Live was the most popular local show in Seattle and had the "purest demographic" for beer drinkers, hence the big revenue from beer companies who never suspected that their ads were being parodied in our High Fiven' White Guys Sketches. Or you may be watching reruns of the same show these days on Channel 5 Saturdays at 1AM right after Saturday Night Live. Chances are you're getting really high. You also may be one of the nine people who regularly watched "The John Report With Bob" the other sketch comedy show I did on KIRO. It's also possible that you could be one of the people who watched me do political commentary on KCTS, but that would also mean that you live in my parent's retirement community. 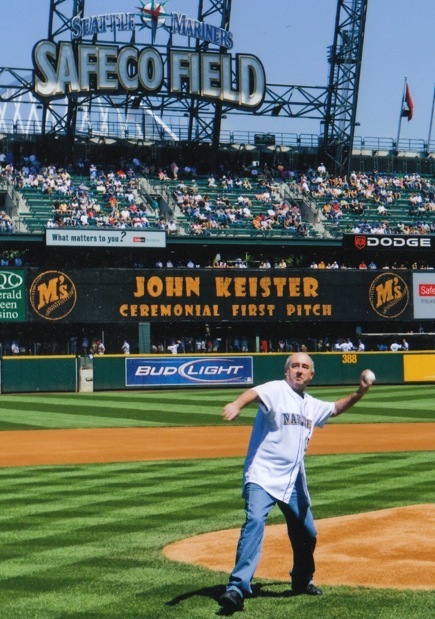 You may also see me at various civic events around Seattle when they decide to do a "Nostalgia Night" - like me on the right throwing out the first pitch at a Mariners game. I got to keep the jersey. Awesome. I've collected some of my favorite bits from Almost Live and the John Report on this site. Take a look. These come from youtube and I have no idea who is posting them. People often ask me if there is a DVD of the material coming out. Well, not officially but I do have some DVD's in my basement. Also some audio CD's. I'm sure we could make a deal. Thanks again for visiting.